When students arrive on Grenada, they are transported to a place of serenity, cultural diversity, and warmth. Home, at least for the time being, is the pastel-tinted architecture of the majestic True Blue Campus, a state of-the-art $250 million campus that includes cutting-edge teaching facilities, labs, library, research institute, and more. Their backyard is the breathtaking lapis blue waters and extraordinary reefs of the Caribbean Sea. With over 65 student-sponsored organizations catering to a wide range of interests, students actively take part in creating a lively and diverse campus community. In addition, the island of Grenada affords students a wide array of activities and events to participate in. In one day, a student could dive the crystal clear waters or hike the Grand Etang Forest in the morning and return to campus for a hands-on lab on exotic and wildlife species. 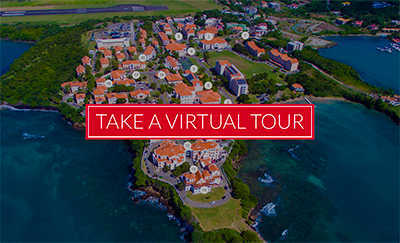 Students are captivated by the unique blend of African, English and French cultures of Grenada. They can immerse themselves in Grenada’s rich history, dining at a local restaurant in the picturesque capital of St. George’s, as native music fills the air. Though many languages are spoken, English is the national language. The Grenadian community has proudly embraced the University and its students. For 40 years, students and community members have lived in peace, with a mutual respect that is genuine and admired. In turn, SGU has been a vital contributor to the island through both financial and humanitarian means. SGU is proud that its students, graduates, and faculty are dedicated to improving the lives of both old and young on the island.